Jana Greene: I think it’s beautiful. I think Jesus cares about the heart of a person. Our bodies are the Temple, yes – but temples can be adorned, or defaced. It’s in the eye of the beholder (plus, there is plenty of grace to cover what society deems as blasphemous. Just my 2 cents. Stranger: Ends don’t justify means. He is the Lamb without spot or blemish. Jana Michelle Greene: Respectfully, without spot or blemish physically? I don’t understand it that way….too surface-based. Jana Greene: Respectfully, the spot and wrinkle – to my heart – is a reference to purity of spirit. God is such a Creative Force, I believe he appreciates art. I know we are made in His image and perfect the way we are born (to Him) but my Jesus is an “in the trenches” force of redemption. He bore our transgressions. The image of a tatted up Christ squeezes my heart, because it is a visual of Him bearing them. I used to feel the exact same way that you do about tats (piercings, etc.) but I no longer do. After struggles with many transgressions myself (including being an alcoholic in recovery) I can appreciate that skin is skin and Grace is sufficient to cover all – surface deep and spirit-deep. I love a good debate. Not argument, mind you – but a nice, flowing exchange of reason. And I’m grateful for the thoughtful interchange. Still … is it “letter of the law” to bicker about this? I am not offended by tattoos, in general. But I also read The Message translation of the Bible – I am that Christian. That opinion, admittedly, has been hard-learned (see More than Many Sparrows – https://thebeggarsbakery.net/2012/04/21/more-than-many-sparrows-my-daughters-tattoo/). When I saw it, it didn’t occur to me that an image of Jesus was desecrated. It didn’t bring to mind my Jesus going through all of the stages of tattoo-dom….., trying to choose just the right design, in just the right font and color – and then schlepping down to Ink n’ Such and going to the artist to ask for a tattoo on his arm or back. Metaphorically, He did chose to be covered – without getting picky about the color, style, or location of the markings. He took it all. When I first saw the image, it just broke my heart. Oh, the humanity! Oh, the Holiness! All so that we can be found without blemish to the Father. Tattoos are a human thing, right? He wouldn’t have marked Himself. That’s kind of the point. It WAS humans who covered him in stripes. He WAS branded in a literal and figurative sense, by humankind. But – GOOD NEWS! – He was also branded, marked (and, semantics notwithstanding) tatted up FOR all humankind. And if the sins of the people were represented by tattoos, there wouldn’t be enough ink in the world for it to be represented, and Jesus wouldn’t have had enough surface space on his body to accommodate it. By his blood I am healed. In the beautiful representation of all he carried to the cross – by His Ink, I compromised my shame and sorrow, and He made me whole again. In these tumultuous times, it takes something powerful to get people’s attention. 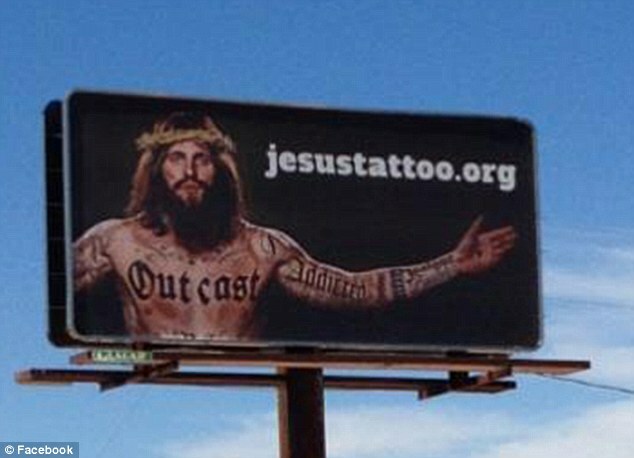 I’m sure that the people who are running this campaign have their heart in the right place, however, I’m not sure that I agree with the idea because it says in Leviticus 19:28 “‘Do not cut your bodies for the dead or put tattoo marks on yourselves. I am the Lord.” Ultimately, it is not what we think about something, it is what God thinks. Some people have a hard time really believing that how we look on the outside doesn’t matter to Jesus. It seems to me that seeing Jesus covered in tattoos makes some people uncomfortable, just like people covered in tattoos make some people uncomfortable. If you watch the video, it’s clear that it’s all about redemption. I think a message with an edge is exactly what some people need for the truth to sink in.